The mask side windows provide a wide field of view.This mask packs maximum performance inside a low internal volume. Designed specially for children. 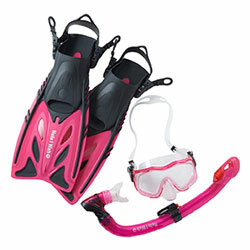 Retains all the functionality of the adult model.With its wide field of view, even children who are novice snorkelers will enjoy the experience. A piston dry system offers a clean look combined with 100% dry performance.Enjoy the ease and comfort of a snorkel that stays completely dry.